He was called Jabari. He had a kindly face with sensitive eyes, that nonetheless showed a hint of the steely edge within. He was one with his environment and dressed in the local garb. No outsider would have guessed he was a respected leader among his kind. He possessed excellent balance and grace while he moved through the jungle. Those who knew him understood that one should not trifle with him, but he was a fair and just leader. Does your environment challenge your imagination to explore the depths of creativity? Nina Campbell’s design is a story in itself. 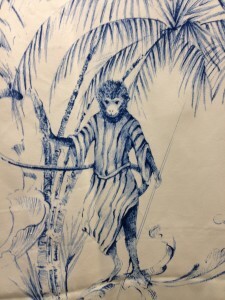 This monkey in the jungle has a sophistication within the design both in the image and the toile fabric. The story of the monkey and his environment can be carried easily throughout the room. Part of a successful thematic approach is to continue the story throughout the interior design of a space. Carefully pick and choose what items you will bring into the space to continue the story. Be very careful though. There is a danger in crossing the line between sophisticated and fun to too much stuff and too cutesy. Find inspiration for your design in the world that surrounds you.